We strongly recommend storing logs in one centralized place when working in a clustered environment. MongooseIM uses Lager - the logging framework. Its backend can be easily replaced; the syslog backend is included by default in MongooseIM. The first parameter is a string to tag all the syslog messages with. The default is mongooseim. The second one is the facility to log to (see the syslog documentation). The last parameter is the lager level at which the backend accepts messages. In our case it's info. Now all the logs of level info will be passed to the /var/log/mongooseim.log file. For more advanced processing and analysis of logs, including gathering logs from multiple machines, you can use one of the many available systems (e.g. logstash/elasticsearch/kibana, graylog, splunk), which collect data from the syslog and are beyond the scope of this documentation. WombatOAM is an operations and maintenance framework for Erlang based systems. Its Web Dashboard displays this data in an aggregated manner. Additionally, WombatOAM provides interfaces to feed the data to other OAM tools such as Graphite, Nagios or Zabbix. For more information see: WombatOAM. Grafana is used for data presentation. Graphite is a server used for metrics storage. collectd is a daemon running on the monitored nodes capturing data related to CPU and Memory usage, IO etc. MongooseIM uses a fork of Exometer library for collecting metrics. Exometer has many plug-in reporters that can send metrics to external services. We maintain exometer_report_graphite and exometer_report_statsd for Graphite and StatsD respectively. It is possible to enable them in MoongooseIM via the app.config file. The file sits next to the mongooseim.cfg file in the rel/files and _REL_DIR_/etc directories. Below you can find a sample configuration. It shows setting up a reporter connecting to graphite running on localhost. You can see an additional option not listed in the Exometer docs - mongooseim_report_interval, which sets the metrics' resolution, i.e. how often Exometer gathers and sends metrics through reporters. By default, the resolution is set to 60 seconds. Go to http://localhost to view Grafana dashboard that's already set up to use metrics from Graphite. 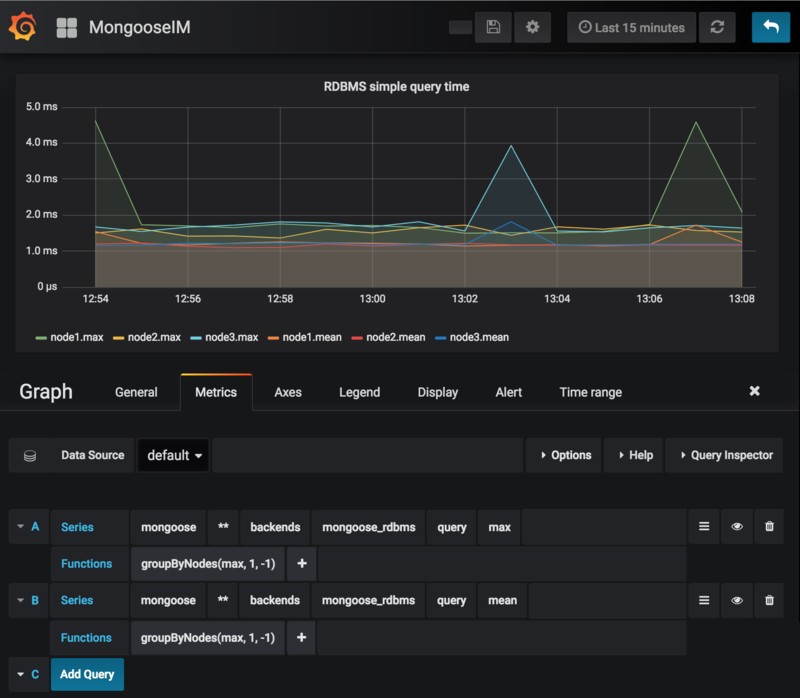 We recommend the following metrics as a baseling for tracking your MongooseIM installation. For time-based metrics, you can choose to display multiple calculated values for a reporting period - we recommend tracking at least max, median and mean. Note that RDBMS metrics are only relevant if MongooseIM is configured with an RDBMS backend, MAM metrics when mod_mam is enabled and MAM flush times when MAM is configured with an RDBMS backend with async_writer option (default). This screenshot shows a graph plotting the RDBMS simple query time metric mentioned above. The graph is plotted for three nodes with each node having a different prefix: mongoose.node1, mongoose.node2 and mongoose.node3. The queries take metrics for all nodes and all domains (** is a wildcard for multiple parts of the metric name) and group them per-node and per-value-type (respectively 1st and -1st part of the metric's name). Parts of the names are indexed from 0. Time-based metrics in MongooseIM are given in microseconds, so to display human-readable values in graph's legend, the Y-axis unit has to be edited on the Axes tab.